This sampling of newly released saucer-type aircraft documents contain detailed technical data and drawings related to the work undertaken by AVRO Aircraft Limited for the Air Force under Project 1794. 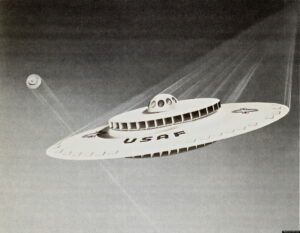 Project 1794 was interested in designing and testing a proposed supersonic vertical take-off and landing saucer type aircraft in 1957-58. The Air Force Declassification Office declassified these documents in June 2001 and the National Declassification Center, National Archives, just recently approved them for public release. Below are direct links to four documents.